The division of East Fishkill from the Town of Fishkill was effected November 29, 1849. All were originally part of the Rombout Patent. The land set off encompassed about 33,000 acres, and formed the second largest town territorially in the county, being exceeded only by the town of Washington. It is bounded on the north by LaGrange; east by Beekman; south by Putnam County, and west by Fishkill and Wappinger. The original settlers of the area were Dutch. 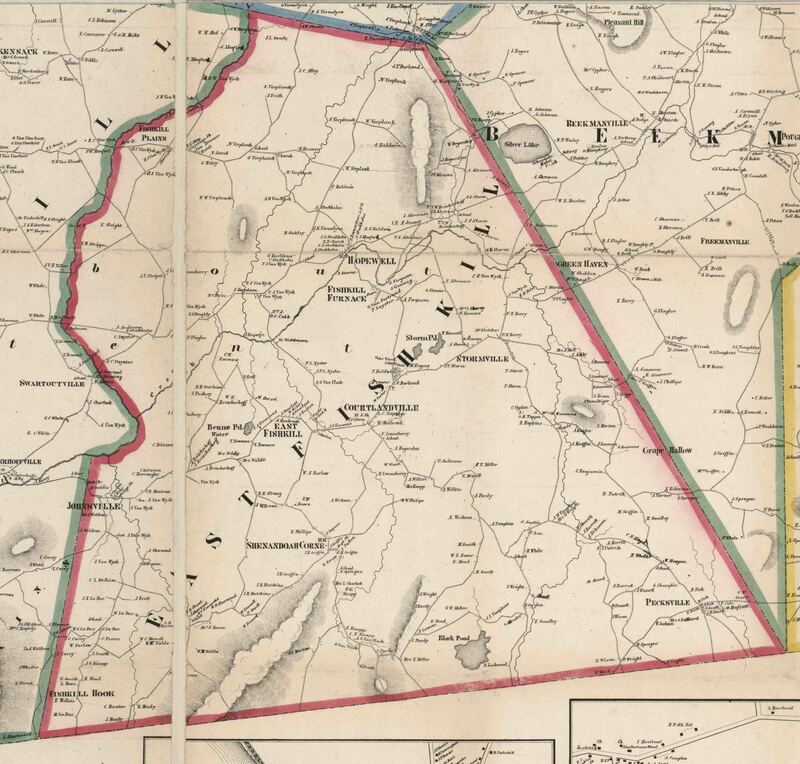 When the railroad extending from Dutchess Junction to Pine Plains was completed in 1869, the Hopewell Hamlet sprang up near the station, and when the New England road was built, intersecting the Dutchess & Connecticut at this point, the hamlet was renamed Hopewell Junction. As a natural consequence the new Junction became the business center of the town. A coal and lumber yard was established in 1869 by R. C. Horton, and the following year Lawrence C. Rapelje built a hotel. The village contained several stores, mechanical shops, and the Borden Creamery. The Borden Creamery was constructed on Railroad Avenue in the Hopewell Hamlet facing the Hopewell Inn in 1901. Many local farmers brought milk to the Creamery to be pasteurized, bottled and transported to New York City. Borden cosed the creamery in the 1930s. 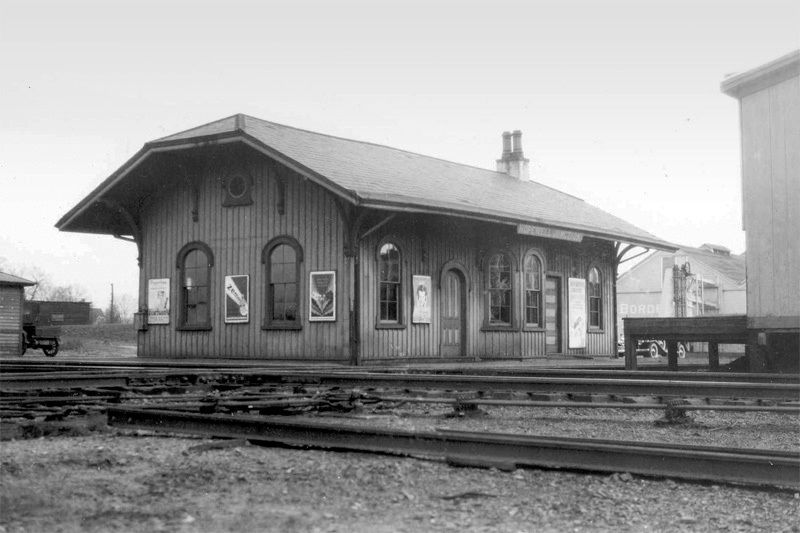 The Hopewell Depot train station was built in 1873 in its original location closer to the Hopewell Inn, and was moved around 1905 to its current location. After a fire in 1986, an extraordinary effort by the Hopewell Depot Restoration Corporation led to the restoration of the Depot as it stands today. Captain Jacob Griffin’s Tavern, located on Route 82 in the former Swartout District, played a major role in the New York State’s involvement in the Revolutionary War. Griffin hosted meetings of the Committee of Observation of the Rombout Precinct (which became Fishkill and East Fishkill), at the Tavern, as it supervised the signing of the Articles of Association by the men of the precinct, aligning themselves with the Continental Congress against the British Parliament. 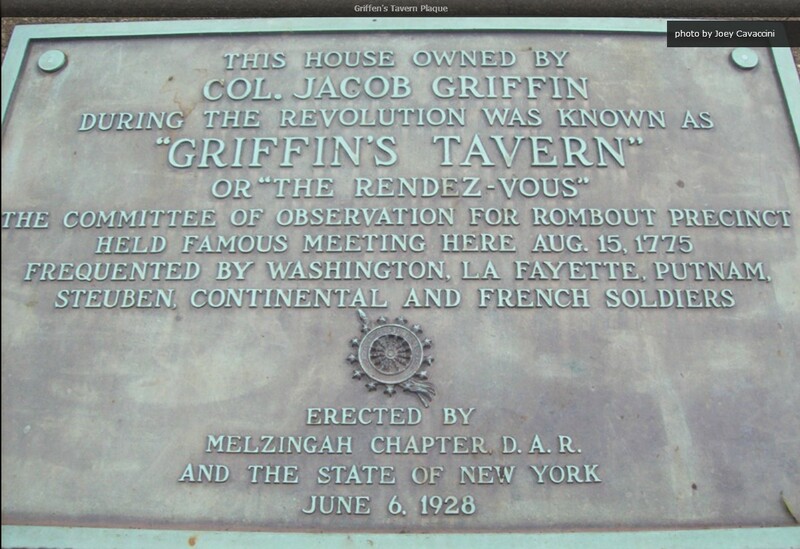 General George Washington, Marquis de Lafayette, General Israel Putnam and Baron Friedrich von Steuben were all known to meet frequently at Griffin’s Tavern. The Fishkill Creek played an integral part of the development of East Fishkill and Dutchess County as the earliest settlers founded communities along the Creek. At one time, cider mills, sawmills and electric generating mills existed up and down the Creek. Today, East Fishkill covers approximately 53 square miles, has a population of approximately 30,000 and contains several Hamlets and neighborhoods (some of which are now in the history books...), Arthursburg, Courtlandville, Fishkill Hook, Fishkill Plains, Gayhead, Hillside Lake, Hopewell Junction, Hortontown, Leetown, Lomala, Pecksville, Shenandoah Corners, Stormville, and Wiccopee. Arthursburg, named after the twenty-first President of the United States, Chester A. Arthur, is located along New York State Route 82 to the northern-most Town boundary with LaGrange. 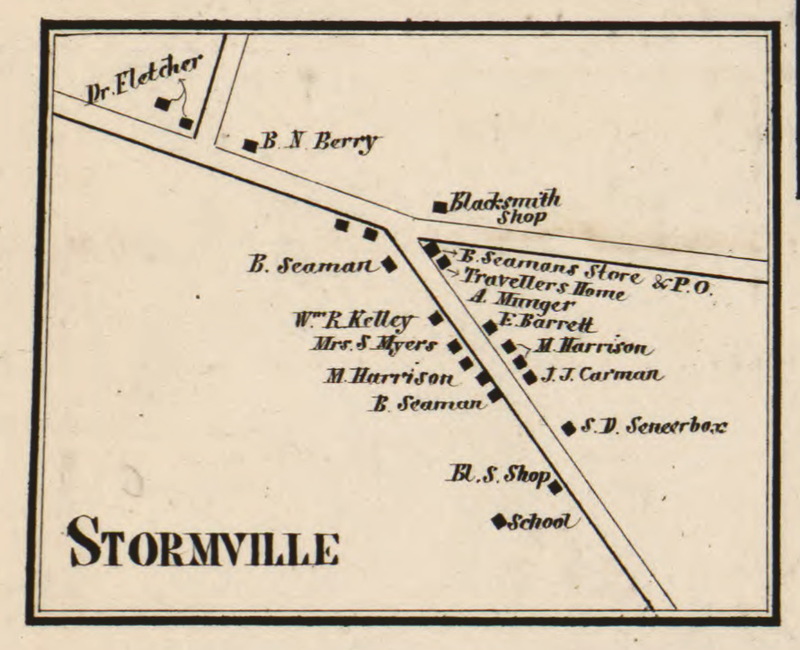 Courtlandville was a hamlet that existed between Gayhead and Stormville. 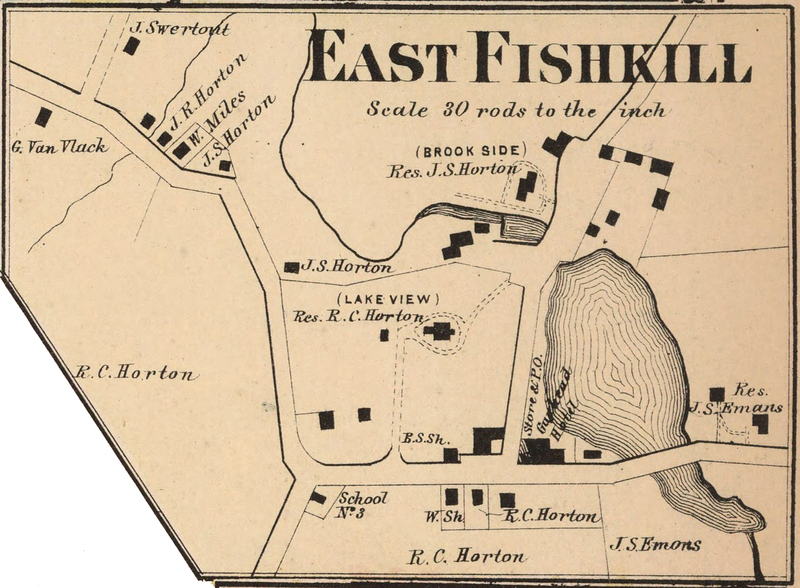 Fishkill Hook was a hamlet that existed in the old West Hook District in the southwestern-most corner of East Fishkill. Named for the large iron furnace, located on the Fishkill Creek near Dutchess County Route 29 / Carpenter Road, just south of Hopwell Hamlet, which manufactured pig iron taken from Sylvan Lake in Beekman. Fishkill Plains is located in the northeast portion of East Fishkill, along New York State Route 376 from the Sprout Creek to the intersection of Route 376 and Dutchess County Route 29/Hillside Lake Road. The Montfort family were early settlers in the vicinity of Fishkill Plains. Peter Montfort bought 370 acres of land here in 1735. His son, Peter, was a soldier in the Revolutionary War, and the family was active in the establishment of the Reformed Churches at Hackensack and Hopewell. Gayhead is located along New York State Route 52 from its intersection with New York State Route 376 to the Taconic Parkway. Aaron Van Vlackren was the pioneer settler in the neighborhood of Gayhead. His son, Tunis Van Vlackren, built the ﬁrst mill at Gayhead about 1768. Gayhead Pond, once located at the northeast corner of the intersection of New York State Routes 52 and 82 and now silted in, disappeared when the dam, located on the west side of Route 376 breached. Gayhead was once the home of numerous large agricultural farms. 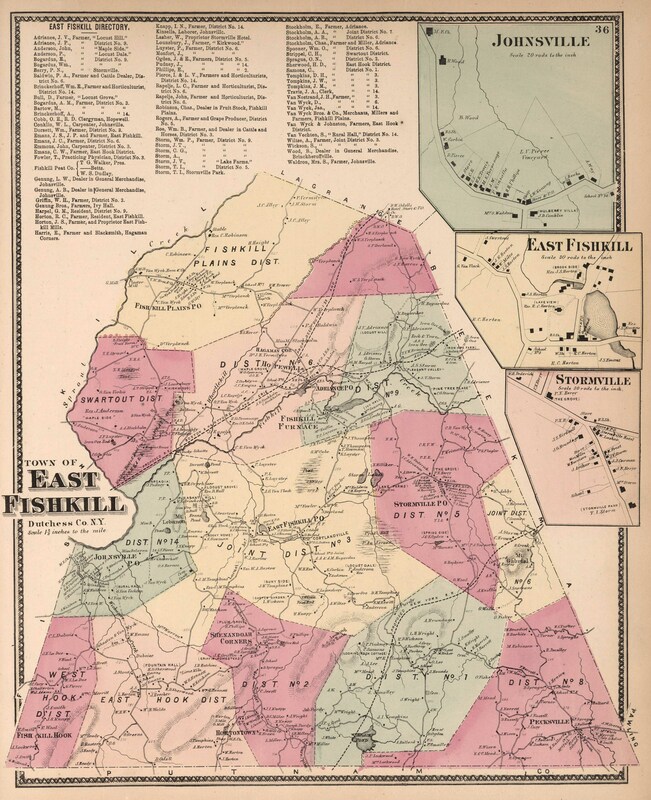 The map below labeled "East Fishkill" is actually Gayhead. The map illustrates Gayhead Pond at the intersection on future New York State Routes 52 and 376. A portion of the main roadway shown to the west is known as Old State Road today, before the NYS Route 52 realignment. 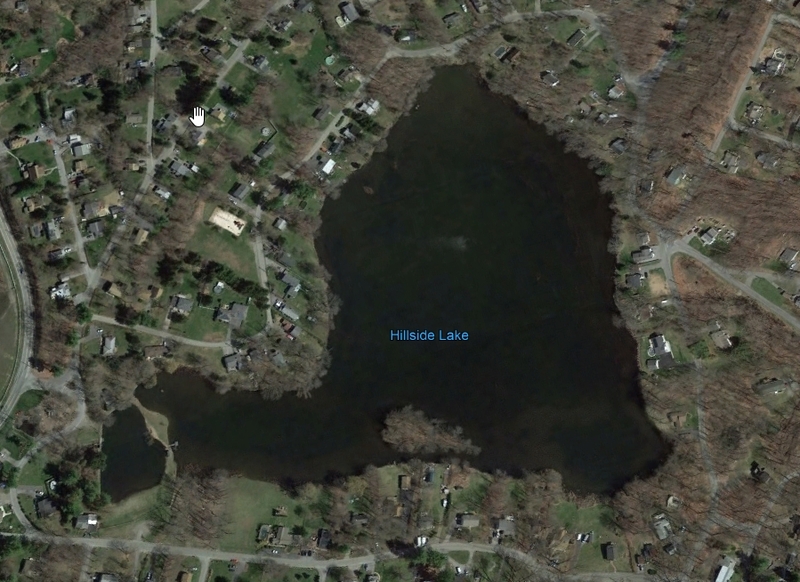 Hillside Lake is a community of approximately 400 homes, situated in the northeast portion of East Fishkill. The community was created when the Hillside Lake dam was constructed in the early 1930's. 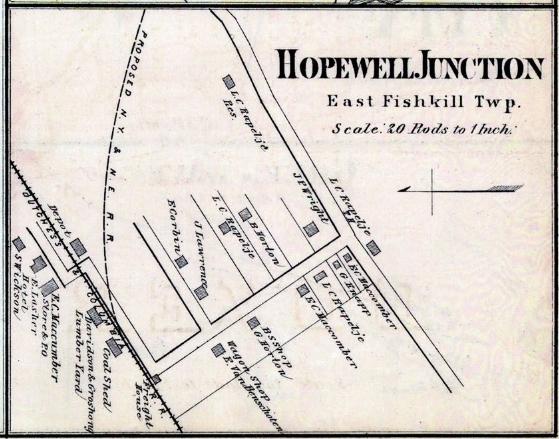 Hopewell (originally named East Fishkill) was the Town’s first settlement. Founded in 1757, the first house of worship in East Fishkill, the Hopewell Reformed Church (formally the Dutch Reformed Church), was constructed in 1764 (and later replaced in 1834) on Beekman Road. This area was also known as "Adriance" after members of the Adriance family who settled the area in the mid-1700’s. Hortontown was located near the southern border of East Fishkill, not far from the Putnam border, along Hortontown Road. 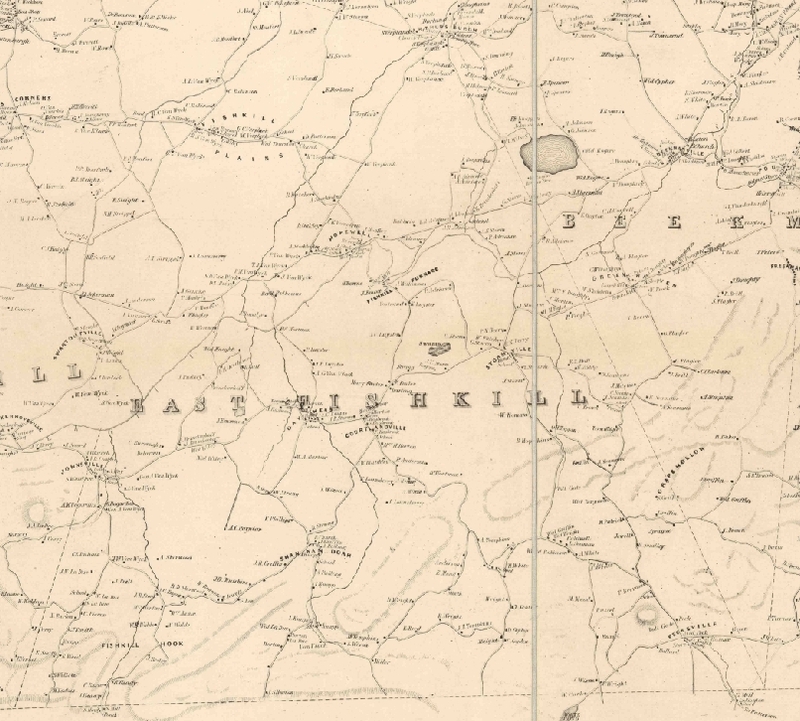 Lomala, located on the south side of Route 82 between Hopewell Junction and Fishkill, is a Finnish community in 1926. 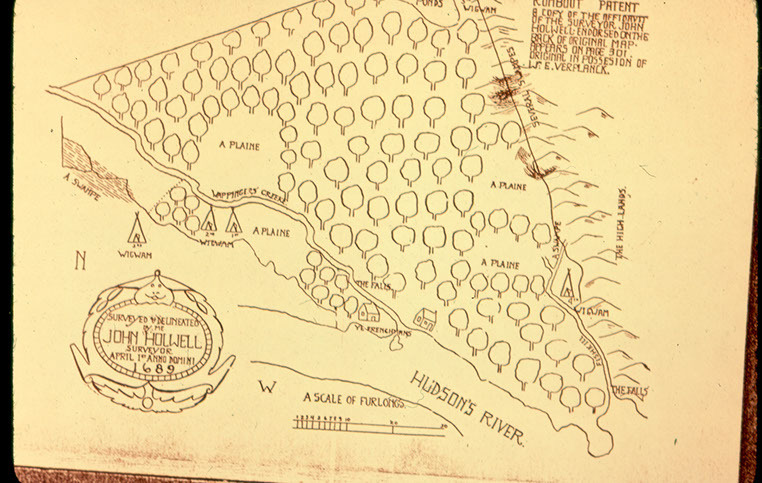 The original property originally spanned 336 acres in the towns of Wappinger, Fishkill and East Fishkill, and was developed by Col. John Brinckerhoff in the early 1700s. Finnish immigration peaked in the early 20th century and skilled workers, tailors and craftsmen, settled in New York City. A group of Finnish began searching for property to create a vacation site away from the urban setting. They purchased the old Brinkerhoff property, naming it the "Summer Vacation Farm Cooperative", ultimately choosing "Lomala", Finnish for "vacationland". Pecksville, located in the southeastern corner of East Fishkill, is bordered by the Town of Beekman to the east and Putnam County to the south, and was once the home of a toll gate for stagecoaches. Shenandoah Corners was located at the intersection of Shenandoah Road and East Cross Road. 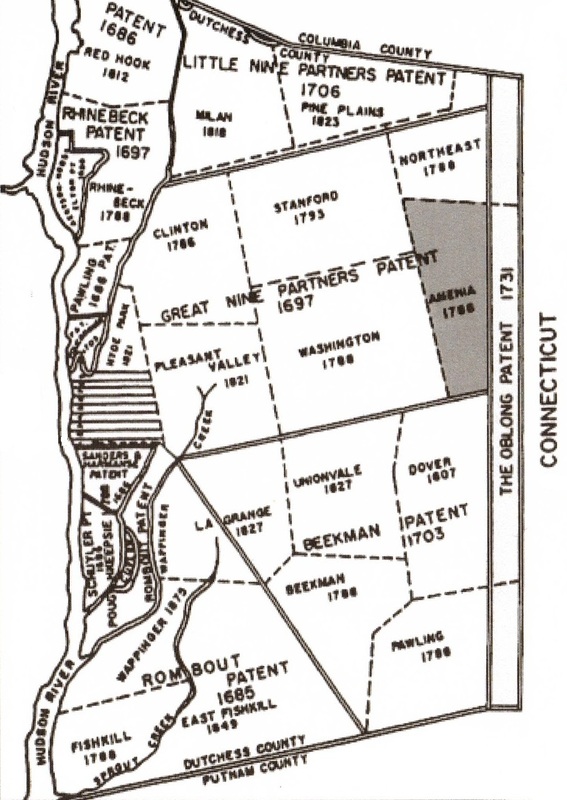 The settlement at Stormville, located at the intersections of Dutchess County Route 216, Old Route 52 and Seaman Road, was begun as early as 1739. Derick Storm was the ﬁrst to "take up land" here. The Storm family were slave owners and the family’s Slave cemetery can be found on Phillips Road. 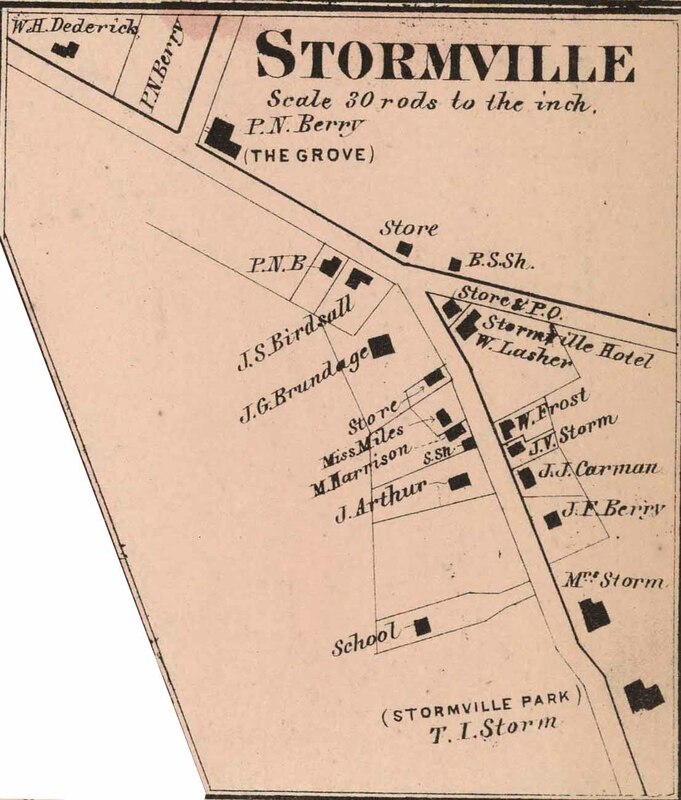 During the Revolution an American force was encamped for a short time just north of Stormville. This force was one of many that was posted back of the river to oppose the suspected inland march of the British to the upper Hudson. The maps below illustrate the intersections of what are Dutchess County Route 216, Seaman Road and Old Route 52 today. Temporarily renamed Johnsville (and renamed back circa 1900), Wiccopee is located along East Fishkill’s western border. 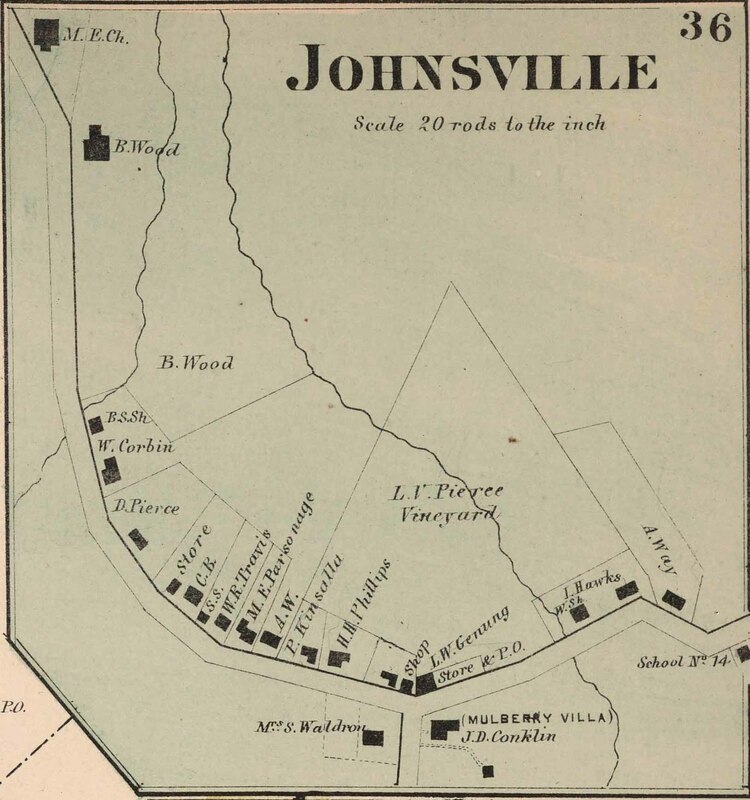 Found in the list of County inhabitants of 1740 is the name Swartwout, the ﬁrst family to settle in the vicinity of Johnsville. Johnsville Methodist Episcopal Church, constructed circa 1826, was later renamed Wiccopee Community United Methodist Church. Constructed circa 1760s, the Wiccopee General Store served the hamlet as both a General Store and Post Office for many years. The map below illustrates the intersection of Hook and Fishkill Hook Roads before the realignment for the future New York State Route 52. Be sure to visit the East Fishkill Historical Society Website! 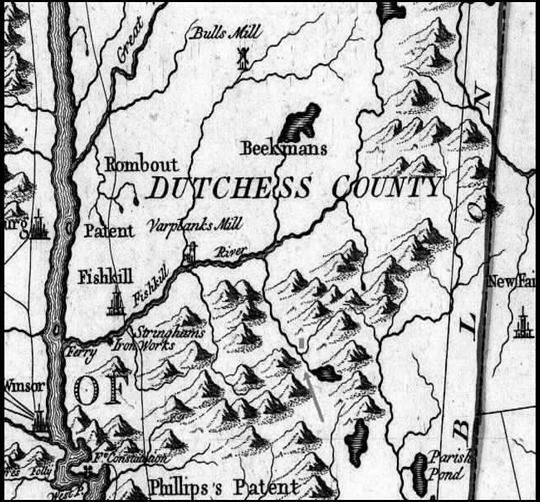 History of Duchess County, New York 1683 to 1882, James H. Smith, D.Mason & Co.